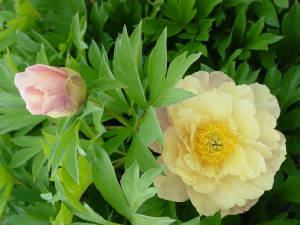 Many intersectional hybrids have flowers that are blends of yellow and pink. The base color is usually yellow with a pink flushing or suffusion. The pink is generally most prominent when the flowers first open but usually fades after a day or two as the flowers mature. In some cases, however, the pink suffusion stays as the flowers mature especially on the outer most petals. The combination of mature and opening flowers gives a beautiful two-tone effect that can be at times quite stunning. 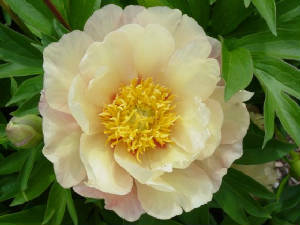 In each case, however, yellow is the dominant color and therefore, I refer to these flowers as yellow blends. Below are a number of examples of yellow blends. Click on pictures above to see more photos of that hybrid.